In 1956, in the Railway Institute, was created the Engineers' Orchestra, based on two string quartets formed by engineers-dilettante musicians, by the engineer Petru Ghenghea, cello player, its conductor. The orchestra is carrying on an ancient tradition of the Romanian Railways still 1936 were founded a Symphonic Orchestra of the Railways Engineers; its animator was the engineer and professor at the Bucharest Polytechnic, Ioan Tomescu, a well-known viola player, expert in chamber music. This orchestra had at its desk great masters as Theodor Rogalski and Constantin Bobescu. Prof. Ghenghea was a cello player in the orchestra. During the War, the rich musical library of the orchestra was destroyed, as well as the most of the instruments. The Orchestra's members dispersed, but the passion for the music was still alive. Prof. Ghenghea did his best for setting up again the orchestra and for going on with the tradition. The principal aim of this orchestra was firstly to promote the gifted people among the engineers. The repertoire was pre-eminently from the Pre-Classical music, that serene and well balanced music of the 18-th Century; it was accessible to the amateur musicians; it was not much performed, but very well and successfully received by the good music lovers. 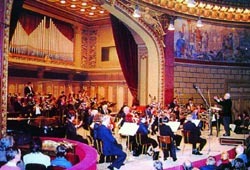 The setting up of a chamber orchestra performing especially the music of the Baroque became a need for cultural life. The conductor Petru Ghenghea promoted also the soloists among the engineers. The Concertino Choir is the art group that continues, more over five decades, the activity initiated by a group of enthusiastic railway engineers, conducted by prof. Traian Buhlea. The art group, who performs preclassical and classical stuck from the Romanian and international repertoire is appreciated by its auditory. The group has gained diplomas and awards in contests and festivals in Romania, Italy, Poland, Netherlands, Belgium, and Czech Republic. 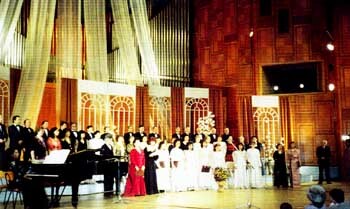 With the soloists of the Romanian Opera house, Music Academy, Eugenia Ilinca prime soloists of the National Musical Comedy Theatre, the Concertino Choir delights permanently the devoted public with special yearly concerts. "The belief that through the music our aspirations will become more noble unit us" is the motto of the art group members and of it conductor. On 1 April 2012 took place at the headquarters of the General Association of Engineers in Romania (AGIR) in Calea Victoriei no 118, the meeting for the setting up the literary circle of the writers that are engineers, under the name of "Literar-Ing". The initiative is meant to support the activity and the image of engineering judgment in Romania by other means than those purely professional, for the development of the cultural dimension of the personality of engineer. This circle comes to supplement the activities of the cultural artistic existing within the framework of AGIR – The Engineers Orchestra, Concertino Choir and the Circle of Epigramists Engineers. The meeting was attended by: Nicolae Vasile, Constantin Raduti, Ioan Ganea-Christu, Gheorghe Indre, Alexandru Pacioga, Titi Turcoiu, Corneliu Berbente, Gheorghe Manolea, Nicolae Doftoreanu, Artemie Vanca, Ovidiu Tutuianu. At the first meeting it was established the Literary Circle leadership: President - Nicolae Vasile; Vice President - Gheorghe Indre; Secretary - Ioan Ganea-Christu. Circle meetings are held monthly, in the 3rd Tuesday of the month at AGIR in Dacia Boulevard no 26, Nicolae Vasilescu - Karpen Hall, et. 1. Circle is an open structure to other colleagues who wish to participate in the future. On 27 January 2012 was held in Bucharest, at the headquarters of the General Association of Engineers in Romania in Dacia Boulevard no 26 the setting up meeting for the Epigramists engineers circle. In the opening, the AGIR President EurIng Mihai Mihaita, stressed the importance of this cultural event. ING- EPIGRAMA circle meetings will take place once a month, in the 2nd Tuesday of the month, 17.00 at AGIR in Dacia Boulevard no 26, 1st floor, invite all founding members, as well as all the engineers who write epigrams to join the circle.